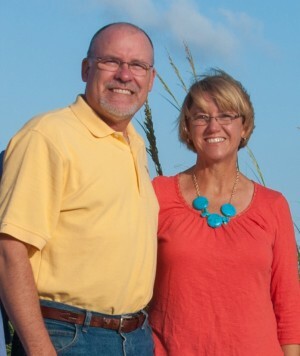 Beth and Kelly Crissman, ordained elders in the United Methodist Church, serve as the leaders of Plowpoint is a non-profit ministry that has served over 500 churches and thousands of church leaders across geographic and denominational lines. This ministry, called on by leaders of churches in sixteen different denominations and twenty-nine states, has impacted the ministry of pastors and lay leaders in local churches around the world. Be sure to look at the Liberia page to see Plowpoint ministries in the West African nation of Liberia. Beth and Kelly bring a wealth of real-world knowledge and experience to Plowpoint. Before ministry Beth worked as a family nurse practitioner, a health administrator, a clinical director for community health centers, and an assistant professor in a medical school. Kelly worked in construction, farming, truck driving and various positions for a furniture company in North Carolina and California. Beth and Kelly have also served as pastors of churches in North Carolina, Georgia and California. These churches, in urban, suburban and rural settings, provide a context of understanding for the ministry services of Plowpoint. Longing to Belong: learning to relate as the Body of Christ. Feeding and Leading of Shepherds: learning to relate as sheep and shepherds. Stepping in the Stream: learning to relate to the will of God. And is the co-author of a new book: Choosing the Faithful Path. Beth and Kelly have also edited and published books for other authors through Plowpoint Press and another press publishing non-religious titles. A graduate of the University of North Carolina-Chapel Hill (BS Nursing), Beth also has degrees from the University of California-Los Angeles (MNursing-Family Nurse Practitioner), and Emory University (MDiv). Kelly graduated from Elon University in Elon, NC and received the Master of Divinity degree from Claremont School of Theology in Claremont, California. The Ministry of Plowpoint began in January 2003 to strengthen the ministries of congregations and their leaders. Plowpoint is incorporated in the state of North Carolina and is a 501(c)(3) non-profit charity. Since our beginning, we have worked with hundreds of congregations and thousands of church leaders in various denominations throughout the United States and beginning ministries in Russia and Liberia. What is the mission of Plowpoint? that transform churches and church leaders. What is God’s vision for Plowpoint? through the power and promise of God’s Word. What are Plowpoint’s Core Values? Scripture is our plumb line. Therefore, everything we do and teach in the ministry of Plowpoint must be aligned with and reflect God’s Word as found in both the Old and New Testaments. The Church is called to be an instrument of healing for this broken and hurting world. Therefore, Plowpoint is called to repair and prepare the Church to become effective instruments of God’s healing and grace for others. Our function (WHAT we DO) within the Church must flow from our identity (WHO God has called us to BE). Therefore, Plowpoint works with pastors and congregations to gain clarity in their calling to do the God-things God has uniquely called them to accomplish. Without healthy, intact, and enforced boundaries, a body cannot survive much less thrive. Therefore, Plowpoint works with the Body of Christ to reclaim godly boundaries to protect the integrity and function of our life and ministry together. God will provide everything we need to fulfill His will and vision for us in our lives and ministry. Therefore, Plowpoint equips and encourages churches and church leaders to trust God’s provision and avoid indebtedness in our personal lives and ministries. How we lead, others will follow. Therefore, we must embody within our personal lives and in our ministry the aspects of Godly leadership we teach. It’s all about the relationship! The healing and equipping of the Church is first and foremost about healing our relationship with Jesus Christ and the restoration of our relationships with one another in the Body of Christ. Until these relationships are restored, true reparation and preparation are not possible. Is Plowpoint denominational or limited to a certain denomination? Plowpoint is a non-profit ministry incorporated in the state of North Carolina and is recognized by the IRS as a 501(c)(3) organization. This means your donations are tax-deductible and are essential for the continuation of our ministry. Plowpoint also operates under the direction of a Board of Directors and the guidance of the Holy Spirit and scripture. Who are the people on staff? Beth and Kelly Crissman, ordained elders in the United Methodist Church, are the founders, shepherd, and steward of Plowpoint. Prior to beginning the ministry of Plowpoint, Beth and Kelly served churches in California, Georgia, and North Carolina. Other staff are lay members of churches of various denominations throughout the United States. The entire staff of Plowpoint love fully Jesus Christ, the Church, and her leaders and have devoted their lives to be in ministry to the Church.